This is the very best ever healthy clean eating pita recipe. Plus I have several links to recipes you can make to eat with this great clean eating pita recipe. We have been loving pita bread lately, so today we give you a Clean Eating pita recipe. 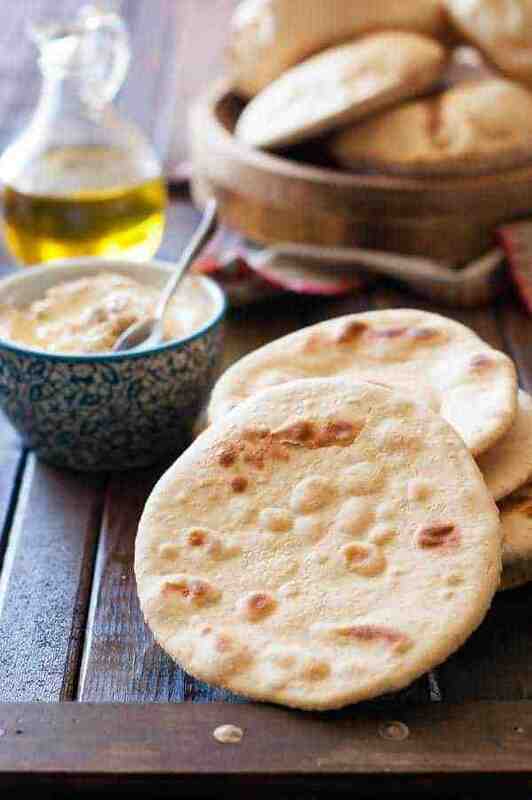 Pitas can be great with some garlic and spread, or a good hummus recipe. It can also go well with a meal or as the bread for a sandwich. Whichever method you choose to eat your pitas, it is crucial to have a good recipe that fits within your lifestyle. This pita recipe is great for a Clean Eating lifestyle. This recipe took a few rounds to get right, but I found that I liked the combination of spelt and einkorn better than just spelt by itself. I found that baking the pitas with the dryer side (the side that had been up while resting) up resulted in flatter, more bubbly pitas, but when I flipped them first before baking they puffed up quite nicely. 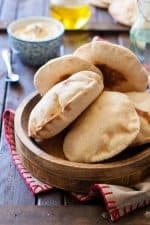 My children love it when I make pitas because they get so excited when they get all puffy and they think it’s really cool to put food in the middle of the pita. Oh, to be a kid again . . . These pitas would go wonderfully with our Best Classic, Smooth Clean Eating Hummus, it is very smooth recipe and tastes great. We also have a for you to make with this pita bread. They would be good with this Vegan Baba Ganoush also. What do you want to use your pita for? Will you make Tzatziki chicken, a Greek gyro, a pizza, dip it in garlic sauce, eat it with Oven Roasted Chicken Shawarma? Comment below – we would love to hear your favorite ways of eating pitas. And enjoy the new recipe! We have new ones coming every week! This recipe took a few rounds to get right, but I found that I liked the combination of spelt and einkorn better than just spelt by itself. I found that baking the pitas with the dryer side(the side that had been up while resting) up resulted in flatter, more bubbly pitas, but when I flipped them first before baking they puffed up quite nicely. Combine the einkorn flour, spelt flour, salt, and yeast in the bowl of a stand mixer fitted with a dough hook. Mix the honey and warm water together. Mix in 1 C. of the warm honey water with the dry ingredients on low speed. Slowly add more water, 1 tablespoon at a time, until a dough forms. Dough shouldn’t be sticky, but not too dry, either. You may or may not use all of the water. If you add a little too much, add a little more einkorn flour until it is not sticky. Dust your work surface lightly with einkorn flour and knead the dough for 10 minutes, or until pliable and springy. 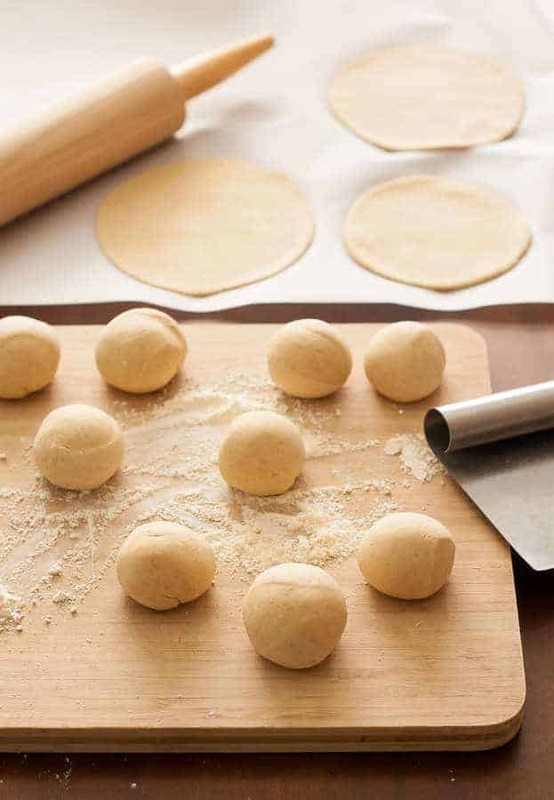 Cut the dough into 12 equal pieces and roll each piece into a ball. Using a rolling pin, roll each ball into a small round, about 1/4″ thick. Place dough rounds on 2 parchment lined baking sheets. Cover with a towel and let rest in a warm location for 1 hour. Preheat the oven to 500 degrees. Place a baking stone or baking sheet(upside down) in the preheating oven. When the oven is ready, Place 2-3 dough rounds at a time on the hot baking sheet or stone, flipping them over so that the sides that were down while resting are now up. This will help them puff. Let bake for 2-3 minutes, or until puffed and lightly golden brown in spots. Remove and repeat with the remaining uncooked pitas. I have looked for Einkorn Flour but i have not have any luck, I live in a small city in Canada, so my options are limited, Is thee=re any other flour it can sub Einkorn Flour with ? I haven’t tried any other type of flour. I can’t get einkorn flour where I live either so I buy it on jovial.com. Could I just use 3 cups einkorn flour and skip the spelt? Yes, you could. Just use a little less water because einkorn flour gets way too sticky if you substitute equally with spelt and/or regular flour. We love pitas and hummus. Thanks for the recipe! We love pitas and I can’t wait to try this recipe. I have plenty of hummus in the fridge I made and need to use up. This looks like the perfect recipe for that. They look absolutely perfect. Love how cushiony they are! Thank you for your kind comment. Let me know if you like the recipe! Those look so delicious and healthy!